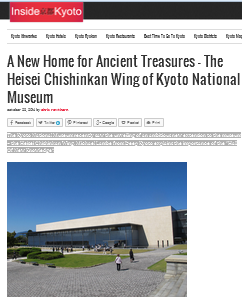 In 2015 I wrote a series of monthly articles for Chris Rowthorn’s website Inside Kyoto. To read them check out the links below. 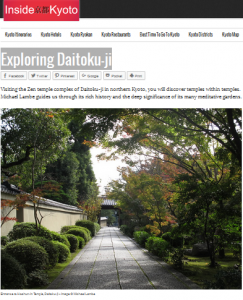 Visiting the Zen temple complex of Daitoku-ji in northern Kyoto, you will discover temples within temples. Michael Lambe guides us through its rich history, the deep significance of its many meditative gardens, and introduces us to some traditional Buddhist vegetarian cuisine. Ohara is many things: a rural retreat, a tourist hotspot, an ancient training ground of spiritual music, and the last refuge and resting place of those who were bested by history. 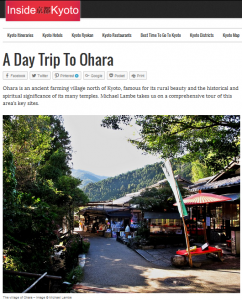 Once, Ohara was considered by the people of Kyoto as a remote outpost in its north-eastern hills. 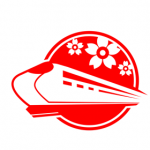 Today, you can get there by bus from the city center in an hour – if the traffic is good. 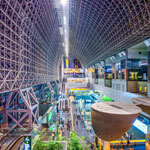 Michael Lambe takes us on a comprehensive tour of this area’s key sites. 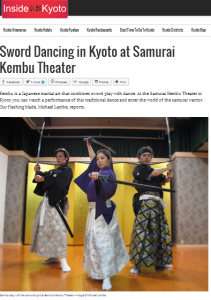 Kembu is a Japanese martial art that combines sword play with dance. 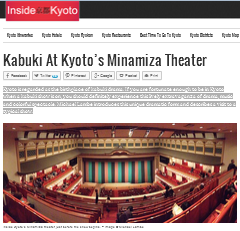 There is a small theater in the heart of Kyoto’s city center, where you can experience first-hand this Japanese way of the sword. The place is called Samurai Kembu Theater and they put on shows and give lessons daily. Our flashing blade, Michael Lambe, reports. 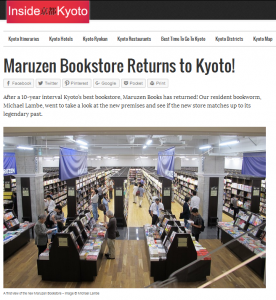 Maruzen Bookstore Returns to Kyoto! This summer saw the welcome return of Kyoto’s best bookstore, Maruzen Books, after a 10-year interval. Maruzen’s Kyoto branch had a long history in this town, and held a very special place in people’s hearts. Our resident bookworm, Michael Lambe, went to take a look at the new premises and see if the new store matches up to its legendary past. 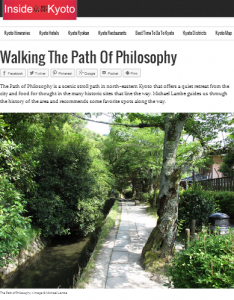 The Path of Philosophy is a scenic stroll path in north-eastern Kyoto that offers a quiet retreat from the city and food for thought in the many historic sites that line the way. Michael Lambe guides us through the history of the area and recommends some favorite spots along the way. 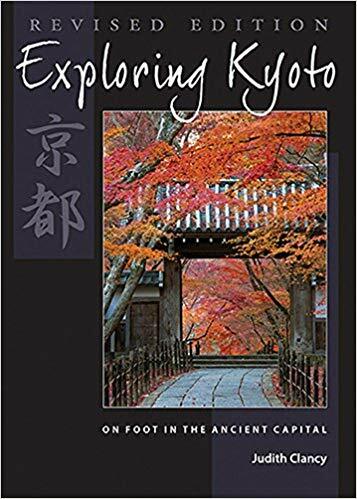 To the south of Kyoto lies Uji, a small city famed for its green tea, its World Heritage sites, and its association with the Tale of Genji – the world’s first novel. Michael Lambe takes us on a comprehensive walking tour of this beautiful city and its most important cultural sites. 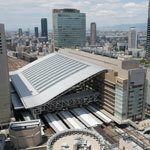 To the south of Kyoto lies Fushimi: a famous center of sake production. 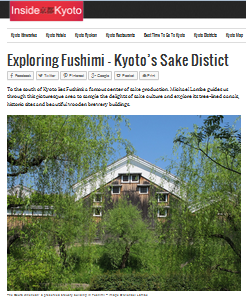 Michael Lambe guides us through this picturesque area to sample the delights of sake culture and explore its tree-lined canals, historic sites and beautiful wooden brewery buildings. 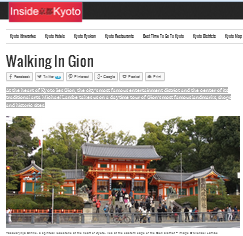 At the heart of Kyoto lies Gion, the city’s most famous entertainment district and the center of its traditional arts. 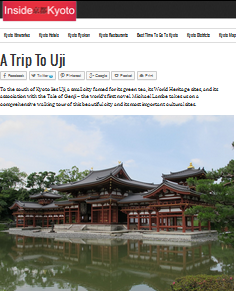 Michael Lambe takes us on a daytime tour of Gion’s most famous landmarks, shops and historic sites. 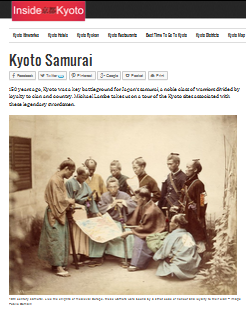 150 years ago, Kyoto was a key battleground for Japan’s samurai, a noble class of warriors divided by loyalty to clan and country. 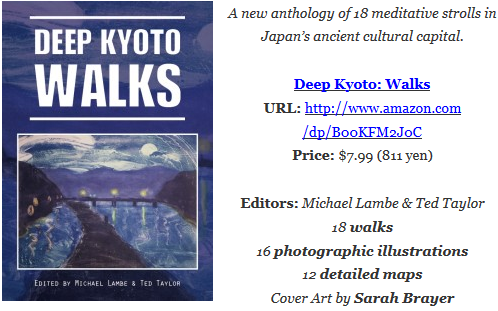 Michael Lambe takes us on a tour of the Kyoto sites associated with these legendary swordsmen. For five lively days in January thousands throng to a small shrine in Gion to pray to Ebisu, the god of good fortune. 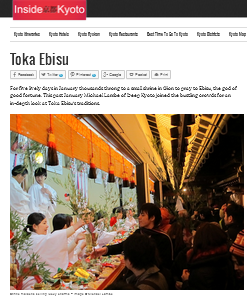 This past January Michael Lambe of Deep Kyoto joined the bustling crowds for an in-depth look at Toka Ebisu’s traditions.